Pick out a radio station from YOUR STATE from the list below to put on your letter to the FCC to complain about Alex Jones' radio hoaxes. To have standing, you need to live within the station's Community of Service. Click on the link following "Coverage Area." If you live inside the circle, you are in the Community of Service. FIND THE LETTER HERE to print. 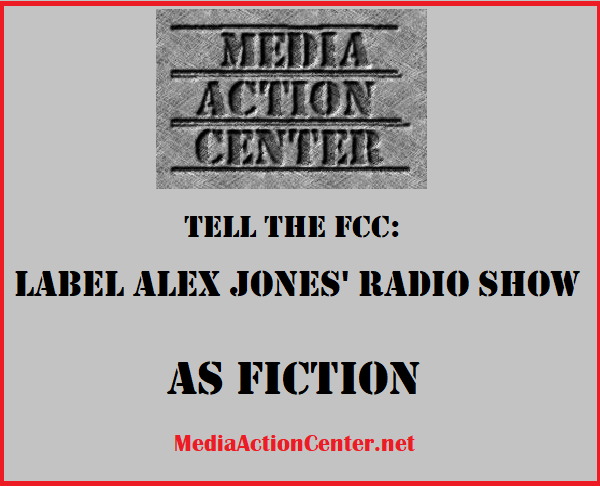 Mail one copy to the FCC and either send another copy to the station or just email the station a copy with your thoughts. No Public file. Discrepancies online. Possible Pirate station. 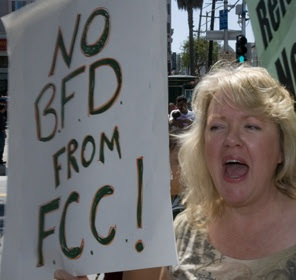 October 29, 2009: Jury finds Entercom Sacramento negligent for Mrs. Strange's death and awards her family $16,577,118, which was later paid by Entercom's insurance company. 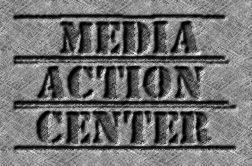 October 31, 2013: On the last day of its license period, Sue Wilson and the Media Action Center file a legal Petition to Deny the renewal of KDND's license to broadcast, citing its negligence in killing Mrs. Strange. October 27, 2016, the Federal Communications Commission orders a hearing on Wilson's Petition. It is a scathing indictment of Entercom, citing inattention to KDND's Public Interest obligation and orders it to prepare for trial by July 27, 2017. It is the first such hearing the FCC has called in roughly 40 years. 1. KDND Staff knew they were conducting a contest which could kill someone. Prior to the contest, they made fun of the water intoxication death of Matthew Carrington on the air, they had their "gag guy" drink a large amount of water as part of their show and laughed as the very large man became light headed and ill. But never informed the contestants of any danger. 2. Many listeners called into the KDND to warn staff that the contest was deadly. Some calls made it on the air so Morning Rave Hosts could make fun of them. Most calls went to management which ignored them. Contestants were cordoned off in the Entercom Sacramento kitchen and were not allowed to hear any of the calls. 3. A Release Form outlining the rules and risks of the contest was drafted, but never given to the contestants. Station manager Steve Weed testified at trial he’d never considered giving rules which actually spelled out hazards of the contest — to the contestants. Instead, a generic release (deemed by the judge to be no release at all) was signed by Jennifer Strange and the other contestants. 4. The original rules (never given to the contestants) stated contestants were to drink 8 ounces of water every fifteen minutes (which is considered safe.) KDND staff and management changed the rules in the middle of the contest to make contestants drink 16.9 ounces of water every 15 minutes, which is considered deadly. 5. People were getting sick, only to have KDND staff post photos of them vomiting onto its Facebook page. 6. Unwritten Entercom rules said a medical professional should be present during such a contest. None was. 7. After the contest, Jennifer Strange told the Morning Rave staff she was too ill to drive home, but they abandoned her to the station's lobby. She finally did drive home, and died there some time later. 8. When Jennifer's co-worker called the station to inform them of Jennifer's death and asked they call the other contestants to warn them to seek medical advice, General Manager John Geary, upon getting advice from Entercom's Corporate office in Massachusetts, told his station manager not to call contestants, but to call lawyers instead. Was KDND serving the public interest? Clearly not. Listen to radio frequency 107.9 starting Wednesday (Feb. 8) and all you will hear is the sound of silence. 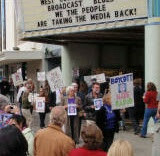 Entercom Sacramento surrendered its license because of a ten year effort by local Emmy winning radio and TV producer turned media watchdog Sue Wilson and the Media Action Center to deny Entercom's privilege to broadcast for completely ignoring the public interest obligation of a broadcaster. Wilson and her attorney Michael Couzens will explain what really happened, why it has taken this long, and its importance to both the community of Sacramento and radio industry at a press conference 1:35 PM Wednesday in the Gold Run Room at Coloma Community Center, 4623 T Street in Sacramento. "You cannot callously kill a mother of three (Jennifer Strange, in 2007) in a reckless water drinking stunt and then say you are serving the public interest," charges Wilson. "Entercom makes it sound like it is surrendering its broadcast license (valued between $20 - 30 million) because of conflicts in ownership rules due to its pending merger with CBS Radio. The truth is, because of the gravity of the "Hold Your Wee for Wii" contest, Entercom Sacramento is currently facing a very rare trial at the Federal Communications Commission which would have taken away the KDND license anyway. "The media giant needs to get this trial out of its way, or it risks losing all its licenses and the CBS Radio merger deal. But it's not quite over yet," said Wilson.